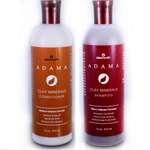 ADAMA Clay Shampoo and ADAMA Clay Conditioner are vegan, natural and mild and can be used on all hair types. Zion Health, a leading manufacturer of high-quality, chemical-free natural skin and wellness products, has added a new shampoo and conditioner to its acclaimed ADAMA product line that successfully combines the healing properties of organic clay and the moisturizing elements of aloe vera with jojoba oil’s ability to restore luster to maximize hair health. Available in health food stores across the country, ADAMA Clay Shampoo and ADAMA Clay Conditioner work to optimize hair health and shine by nourishing the hair follicles and scalp to leave hair feeling and looking healthy, manageable and smelling fresh and clean. ADAMA Clay Shampoo and ADAMA Clay Conditioner Cloud are vegan, natural and mild and can be used on all hair types. Each product contains all of the fundamental ancient healing properties found in Calcium Montmorillonite-rich natural clay products, which have become synonymous with the Zion Health name. Calcium Montmorillonite is special type of clay that contains more than 57 trace minerals, which work to balance scalp pH, improve the quality of the scalp to prevent hair loss, dandruff and minimize the effects of psoriasis. The other key ingredients in ADAMA Clay Shampoo and ADAMA Clay Conditioner are Jojoba Oil and Aloe Vera. Jojoba Oil is a vital ingredient in the hair wellness equation for its innate ability to naturally add shine and luster to hair while the Aloe Vera gel helps clean without drying. The products are also an excellent aid to color-treated hair and hair that has been dulled by excessive heat. Other Zion Products include: Clay Soaps, An Ancient Clay Face Wash, an Ancient Clay Body Wash, an Eye Cream, Hydrating Crèmes, Wrinkle Defense lotions, Hair Care products, and a Mineral Vitamin C Serum. Zion Health strives to provide consumers with the purest, chemical-free skin care products available on the market today. All Zion products are free of parabens, aluminum, sulfates, and are formulated using all natural ingredients – with certified organic ingredients whenever possible. For more information on Zion Health products, go to: http://www.zionhealth.net.